TORONTO (JAN. 31, 2019) – Antoine Vermette has announced his retirement today from the National Hockey League (NHL) following 14 seasons. Born in St. Agapit, Quebec, Vermette was selected 55th overall by the Ottawa Senators in the second round of the 2000 NHL Draft and made his big-league debut with the club Oct. 9, 2003. A Stanley Cup champion with the 2014-15 Chicago Blackhawks, Vermette played in 1,046 regular-season NHL games while scoring 515 points (228-287–515) over his career. He earned a reputation as a durable, two-way forward whose reliability in the faceoff circle (56.6% faceoff win percentage) resulted in the 14th-most faceoff wins recorded (8,948) in NHL history. Vermette enjoyed the better part of five seasons in Ottawa before he was traded March 4, 2009 to Columbus – where he arrived in time to close out the Blue Jackets’ regular season by contributing 13 points over 17 games ahead of skating in the club’s first-ever postseason appearance. His first game as a member of the Blue Jackets also marked the beginning of an impressive 482 consecutive regular-season games played streak that ended six-plus years later. He reached career-high offensive numbers in goals (27), assists (38) and points (65) in 2009-10 – his first full season with the team. After playing in all 82 regular-season games in each of his two full seasons with the Blue Jackets, Vermette was traded Feb. 22, 2012 to the Phoenix Coyotes. He helped the Pacific Division-winning club to their first Western Conference Final appearance by leading the team in postseason scoring (10 points). 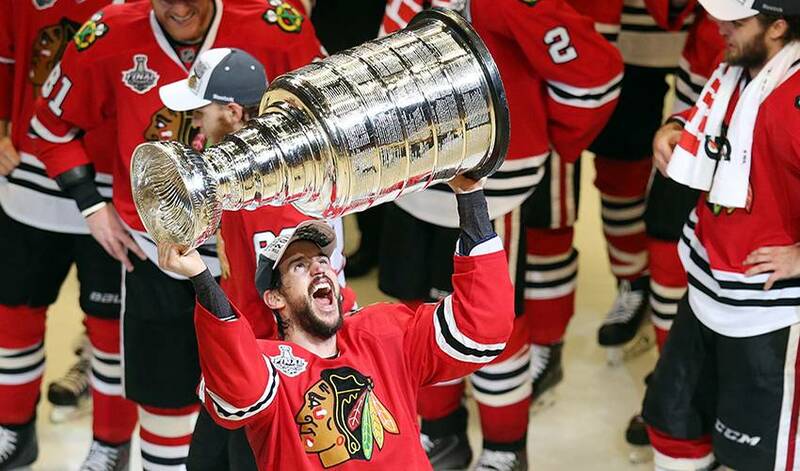 The centre was traded to the Blackhawks Feb. 28, 2015 where he played an integral role in helping Chicago lift their third Stanley Cup in six seasons by scoring three game-winning goals as part of seven points that postseason – highlighted by two game-winners in the Stanley Cup Final against the Tampa Bay Lightning. That summer, Vermette returned to the Coyotes as a free agent. He began his tenure with the Anaheim Ducks in 2016-17 via free agency. He helped the Ducks finish as Pacific Division champions and played in 17 playoff games on the club’s deep postseason run that ended in the Western Conference Final. The 2017-18 season included a pair of personal milestones for the forward. Oct. 7, 2017, Vermette reached the 500-point mark with a game-tying goal in a matchup against the Philadelphia Flyers. One month later, Vermette became the 313th skater to play in 1,000 NHL games – and did so Nov. 15 in front of a home crowd at Honda Center. Vermette’s final NHL appearance (April 14, 2018) was his 97th postseason game. Vermette resides in Quebec, with his wife Karen and three children. As a child, I dreamed of having a chance to play in the best league in the world of my favorite sport. After 15 years in the NHL, here I am, officially announcing my retirement from professional hockey. What a privilege! I am immensely grateful for all these incredible years punctuated by memorable moments that I will cherish forever. For me, hockey has been an outstanding vehicle for teaching the right values such as perseverance, discipline and respect. I would like to outline the importance of the people who believed in me in the organizations of Ottawa, Columbus, Arizona/Phoenix, Chicago and Anaheim for making this unforgettable journey possible. I wish to thank my agent, all of my coaches and assistant coaches, the support staff of the teams that I had a chance to play for and the others that I crossed paths with around the league. I want to thank my fitness trainer, my special summer training group in Quebec City and the members of the media. Also, I want to thank the fans who by their support, contributed to making my dream a reality. It was from their passion that we experienced some magical moments together. It was a privilege sharing my daily life with teammates, to forging friendships that will endure well beyond the victories and defeats. All the players that I had the good fortune to play with enriched my life in a way that is not quantifiable. Thank you "Les Boys"! On a personal level, I feel privileged to have been able to count on the support and unwavering love of the people around me. To my family, my parents, my sister, my wife, my children and my friends by their understanding and thoughtfulness, allowed me in an exceptional way to pursue my dream. There have been tremendous sacrifices made along the way by these caring, devoted and inspiring people. I am eternally grateful. It is with great enthusiasm that I look towards the future and feel a profound joy to finally be able to spend more time with my loved ones, my wife and my kids. Thank you for these beautiful years. Enfant, je rêvais d’avoir la chance d’évoluer dans la meilleure ligue au monde de mon sport favori. Plusieurs années plus tard, me voilà qui annonce officiellement ma retraite de la Ligue nationale de hockey. Quel privilège! Je suis immensément reconnaissant pour toutes ces belles années ponctuées de moments mémorables que je chérirai à jamais. Le hockey a été pour moi un formidable véhicule d'enseignement de valeurs de dépassement de soi, de discipline, de persévérance et de respect. Je tiens dans un premier temps à souligner l’importance des gens qui ont cru en moi au sein des organisations d’Ottawa, de Columbus, de Phoenix-Arizona, de Chicago et d’Anaheim rendant mon parcours inoubliable. Je souhaite remercier mon agent, mes entraîneurs, le personnel de soutien des équipes pour lesquelles j’ai évolué ainsi que les autres préposés à l’équipement croisés aux quatre coins de la LNH. Je veux remercier mon préparateur physique, mon groupe d’entraînement à Québec ainsi que les membres des médias. Et, bien entendu, je tiens à remercier les partisans qui, par leur encouragement, ont contribué à la réalisation de mon rêve et qui, par leur passion, ont su se rendre complices de moments magiques. Partager mon quotidien avec des coéquipiers favorise des rapprochements et contribue à forger des amitiés qui perdurent pendant des années, bien au-delà des victoires et des défaites. Tous ces joueurs que j’ai côtoyés offrent un enrichissement qui n’est pas quantifiable, élevant le sport au-dessus de simples statistiques. Merci les « boys »! Sur le plan personnel, je me sens privilégié d’avoir pu compter sur le soutien et l’amour indéfectible des gens de mon entourage. Ma famille, mes parents, ma sœur, mon épouse, mes enfants et mes amis ont su, par leur compréhension, leur présence et leurs attentions, m’épauler et m’encourager de façon exceptionnelle afin que je puisse poursuivre mes objectifs professionnels. Ces personnes dévouées et inspirantes de ma garde rapprochée ont fait d'importants sacrifices. Je leur en serai éternellement reconnaissant. C’est avec un regard enthousiaste que je me tourne résolument vers l’avenir. Je ressens une profonde joie à l’idée de pouvoir passer plus de temps avec mes proches, mon épouse et mes enfants. Merci pour ces belles années.